Food is regarded as an important part of every celebration. In the Philippines, families all over the country find ways to celebrate around food, drinks, and good company. This February, love ushers in the lunar new year with Valentine’s day and Chinese New Year happening simultaneously in the second week of the month. This February, Fruitas Holdings Inc. (FHI) offers urbanites celebrations of both feasts in style with delicious food selections and good music. 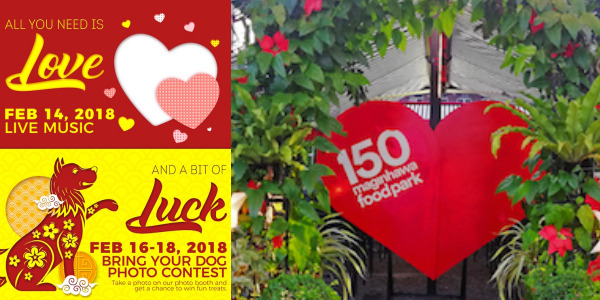 “Fruitas Holdings believes that both love and luck are always worth celebrating, that’s why we’ve prepared back-to-back Valentine’s and Chinese New Year treats for everyone. With this, we hope to provide destinations for these celebrations for everyone to try something new this year,” says Peter Carrillo, Marketing Manager of Fruitas Holdings Inc. “All You Need Is Love and A Bit of Luck”, a special Valentine’s Day and Chinese New Year treat at Le Village Lifestyle Park and 150 Maginhawa Food Park, offers everyone a fun line up of activities to mark the two events. Fruitas welcomes the month with the traditional Chinese delicacy, Tikoy. This much-loved glutinous Chinese New Year delicacy attracts prosperity and harmony as the new lunar year rolls in. Beginning February 1, FHI will be offering these sweet treats at their food parks throughout the month of February. On February 14, good food and music unite as both food parks serenade couples, friends, and families with acoustics from top-rated local bands. The Celestial Acoustic Band, a triumvirate whose songs and performances have earned raves from a steady and strong following, will perform at Le Village. Guests can enjoy listening to their music while being treated to a wide selection of wines and cheeses, burgers, steaks, pizzas, hand-pulled noodles, and other grilled goodies. 150 Maginhawa with its wide-open spaces, majestic trees, and airy feel, provides a romantic backdrop to the music of Project M Acoustic, known for its versatility and wide repertoire. While enjoying their songs and savoring the cool evening breeze, guests can enjoy delicious food from stalls offering an exciting assortment such as buffalo wings, Mexican food, poutine, Vietnamese delights, barbecues and steaks, and churros, to name a few. While Chinese New Year calls for a feast, it is also a celebration of the luck in store in the coming months. 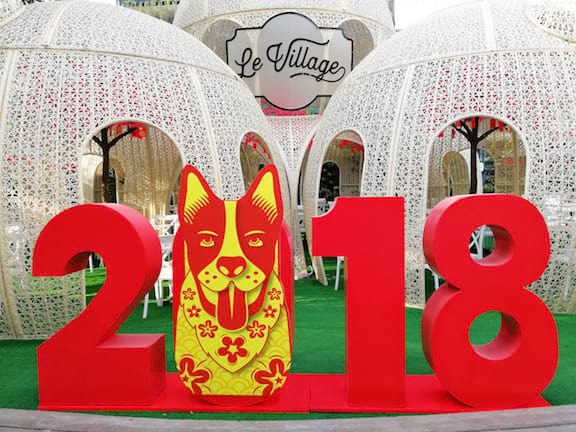 This 2018, Le Village Lifestyle Park and 150 Maginhawa Food Park welcome the Year of the Dog with activities for the entire family—even for the furbabies! 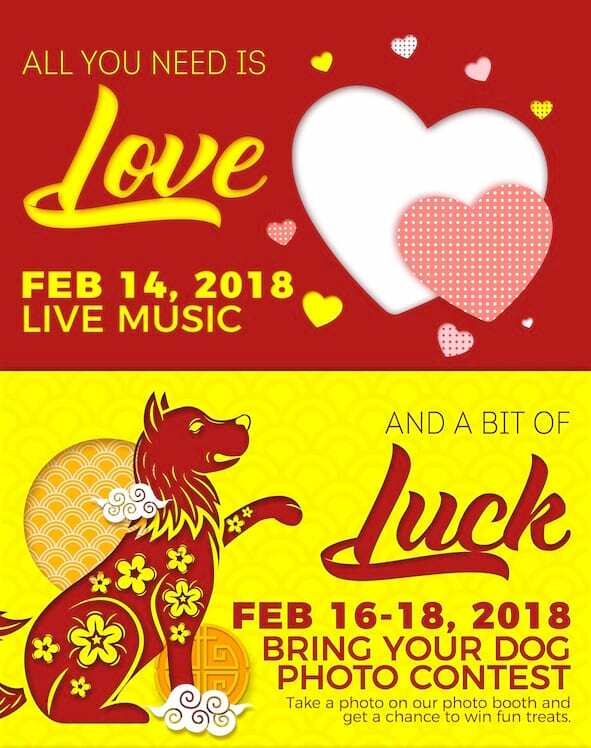 From February 16-18, FHI invites guests to bring their pooches and take part in the Bring Your Dog photo contest by heading over to the photo booths found in both food parks and have a photo of them wearing traditional Chinese costumes. Guests with the best photos with their dogs for each park will win special prizes. Le Village and 150 Maginhawa are set to bring together love and luck with their unique offerings that are sure to delight everyone. Head over to Le Village located at E. Rodriquez Avenue cor. Cordillera, Quezon City and 150 Maginhawa located in Teacher’s Village, Quezon City for truly memorable celebrations. “We at Fruitas Holdings believe that good food should be paired with good memories. 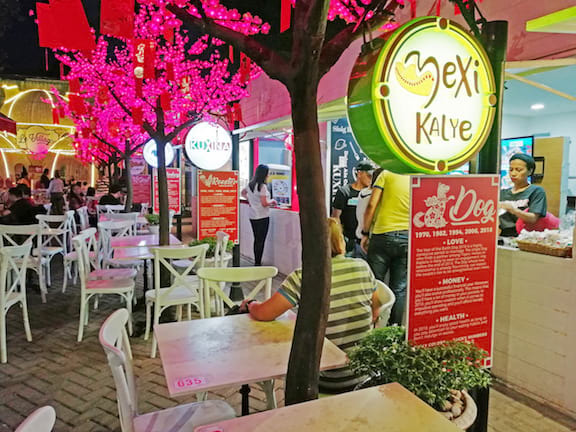 Through our lifestyle parks, we continue to bring not only new food concepts but sophisticated dining experiences as well to Filipinos,” said Carrillo. For more information on the celebration treats and photo contest mechanics, you may follow Le Village Lifestyle Park and 150 Maginhawa on their Facebook pages (https://www.facebook.com/LeVillageLifestyle/) and (https://www.facebook.com/150maginhawa/), and Instagram Le Village and 150 Maginhawa.